This is Daihachi Ryodan's 40th anniversary! What a long strange trip it&apos;s been! Yeah, good times, bad times... but the water goes on flowing under the bridge, and somehow forty years have passed. To celebrate, we&apos;ve put together a new CD with a selection of the music we're making right now, included in the admission price! As if that weren&apos;t enough, we'll be joined that evening by three great horn players. The 16th of March at Tokuzo - please come and join us! 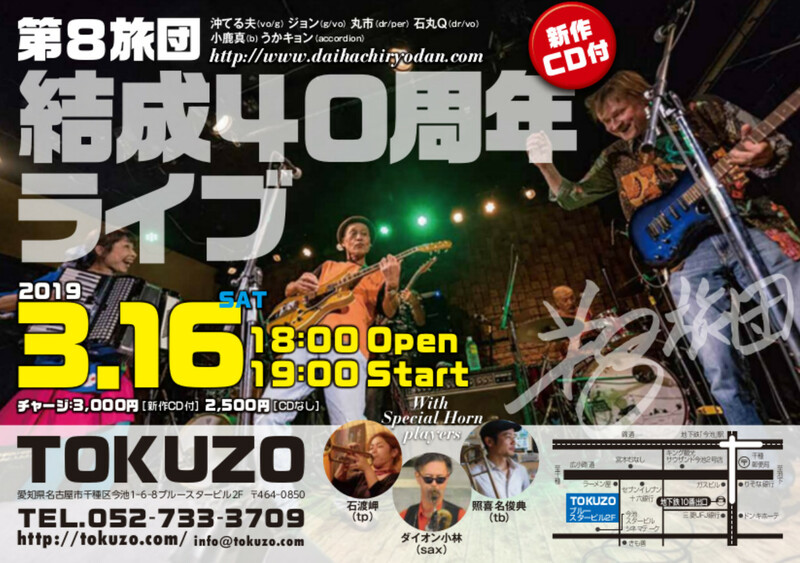 16th March 2019 At Tokuzo in Imaike - our 40 year anniversary concert, and a new CD release! And with a special guest horn section! 7th Apr. (Sun.) Kakuozan Spring Festival! ● Advance tickets at PIA or Tokuzo. We've uploaded our Tokozo performance from November 2018 to YouTube. 30周年記念コンサートの写真、得三で。 Shots from our 30th anniversary gig at Tokuzo, May 2010. Daihachi Ryodan news and we'll let you know about our next concert. ●We're often asked what kind of band Daihachi are, but it's pretty difficult to answer. Most of our stuff is original but we play songs by all kinds of other people too. Genre? Rock, really, but with Middle East, African, Rap, Reggae and other things mixed in. (Bit of Enka?) We're up for anything really. ●The name? It goes back to the Spanish Civil War in the 1930s. At that time there was a democratically elected Socialist government in power, which General Franco's fascist army was trying to overthrow. The International Brigade which gathered from all over the world to support the Socialist government, including such writers as George Orwell, was named the 8th Brigade, or "Daihachi Ryodan" in Japanese. ●Members? Tero on guitar and vocals, John also guitar and vocals, Ojika on bass, Ishimaru on drums and Maruichi on drums and percussion. Twin drums and (nothing to do with music) front line all over 180cm. It's not all that long since this line-up took shape but you could say we're at some kind of peak. Formed in 1980; at that time played in university festivals, events etc., with mostly original material with a strong "message" element, often about environmental or social problems, together with songs by the Beatles, Bob Dylan, Bob Marley etc. With a lot of improvisation, the band had a special "Daihachi" sound. However, in 1986, for members' various personal reasons, the band broke up resulting in a 10-year gap till Dec. 1996. While incorporating new elements, the distinctive, loose sound remains. Now a fairly leisurely schedule results in concerts two or three times a year, often at Tokuzo in Imaike, Nagoya.